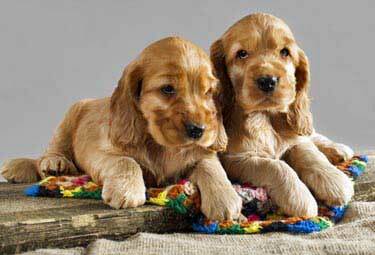 Raising Two Beautiful Cocker Spaniel Puppies - How Difficult Can This Be? Back in September, I purchased one male cocker spaniel from a lady who was overwhelmed with a litter of 10 and 3 adult dogs! While visiting, CoCo, who was of healthy weight and size, seemed very interested in me (but he was also very independent) so I took him home. However, his little brother Peanut (being the runt and very undernourished) tugged at my heart strings, so two weeks later I brought him home too! I know you wouldn't agree with me on doing this but we are crate training and potty training outside (!) and they are getting better at it. Unfortunately, CoCo is being a bully to his brother, and he's not listening when being corrected. He's teaching Peanut bad behaviors like whining and barking when one is in the cage and the other is out, being separated from the pack during potty time, etc. Also playtime is becoming an aggressive sport if not corrected every 3 seconds! It's getting to a point where I'm correcting them more often throughout the day. Please help, I really want them to be comfortable around each other without feeling left out. PS: Is this a jealousy issue or something more serious? Thanks again: Proud Texas owner! Oh dear, it sounds like you've got your work cut out for you! A new puppy care routine can take a good two or three hours out of your day - double that for two puppies! Dogs learn from each other, bad behavior as well as good behavior, and unless you're an expert dog trainer, you'll more than likely end up with two very mischievous (read naughty!) puppies! There's also a danger that your puppies will bond with each other and not with you or any other human. That can be dangerous. It sounds like this is happening already. When Coco is bullying Peanut, are you calm and in control when you step in to separate them? I suspect not (especially after stepping in for the tenth time in an hour!). Don't laugh, but it's important that you don't get stressed - I know...it's not so easy is it? Your puppies will be picking up on your stress and it may be making the situation worse. Next time CoCo bullies Peanut, gently separate them. Stay calm and quiet - you could use the word 'No' in a firm tone, just once. Give both puppies a few minutes apart - 5 minutes apart to help them to settle down and become calm again. Next time put Coco on a long lead so that if he begins to bully Peanut you can gently restrain him or lead him away - that way you are in control. The following recommendations may help your puppies to develop into well-behaved adult Cocker Spaniels (don't laugh...it is possible!). It may also help Peanut to develop his own personality rather than being shaped by CoCo. Exercise and walk your puppies on their own on a regular basis as well as walking them together, as a pack. Walking each puppy separately will help them to get used to their immediate environment without the distraction/intimidation of the other puppy. Watch your puppies when they are alone, I think you'll be surprised a how differently they may behave when they're apart. Stick at it and I'm sure you'll begin to see favorable results. PS: I recommend you read this article on raising two puppies - I think you'll find it interesting and helpful. Thanks for the info! this is very helpful My sister and I truely needed it!